A pilot once said of the Convair B-58, "She looked like she was breaking the sound barrier just sitting on the tarmac." At Mach 2 +, the B-58 wasn't just one of the fastest bombers of her day, she was one of the fastest military planes period. A first cousin of the hot "century series" of jet fighters, the delta winged "Hustler' medium bomber combined outstanding performance with a striking, javelin-like profile that spawned a mystique that survives to this day. In the early 1960s, at the height of the Cold War, in just two years the B-58 captured an unheard of 14 speed and performance records, many previously held by Soviet aircraft. She was not only capable of extended 700 mph on-the deck missions at 500 feet (then unheard of for a bomber and without the advantages of today's ground hugging radar or fly-by-wire) she also set altitude and climb records. The B-58 was capable of doing whatever was necessary to invade enemy air space. As Jimmy Stewart says in this film, she was a lot more than a "hot rod" made for setting records, she was a lethal weapon of war -- and an outstandingly handsome aircraft. Span: 56 ft. 10 in. Wing Area: 1542 sq. ft. Length: 96 ft. 9 in. Height: 29 ft. 11 in. Tread: 13 ft. 4 in. Don't miss these two outstanding B-58 DVDs! -We have digitally restored our video programs. * B-58 Bendix Trophy Race On March 5th, 1962, Capt Robert G Sauer & his crew in "Tall Man 55" took off from Carswell AFB, Fort Worth, Texas to break three transcontinental speed records in one day, over 4,500 miles -- "Operation Heat Rise." The starting gate was Los Angeles, where the Hustler topped up her fuel. Along the way, she slowed briefly again for quick refuels, shown in detail, and reached New York City in just 2 hours & 56 seconds. Then, back to the West Coast, nonstop in 2hrs 15 minutes. The round trip was a total of 4 hours 41 minutes, including refueling, and all three times were transcontinental speed records. * B-58 Low Altitude Bombing Capability This is is a simulated low level, long range attack launched from Carswell AFB in Texas against Edwards AFB in California. Much of the mission is flown at 700 mph and above at ground hugging altitude below 500 feet. 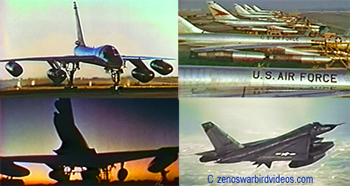 The B-58 exhibited exceptional handling characteristics. Sensational from-the-cockpit views of the Hustler booming along over mountains and prairie. * The Bleriot Trophy In 1930 the French aviation pioneer established a prize for the first aircraft to average over 2,000 kph for thirty minutes-- the Louis Bleriot Speed Trophy. For 30 years, that prize lay unclaimed by any aircraft. See how B-58 Hustler "Firefly," commanded by Major Elmer E Murphy, flying near Edwards AFB in May 1961, took the prize. * Champion of Champions Isn't that the legendary star and war hero James Stewart climbing out of the pilot's seat of the B-58 that just touched down? "Yup" -- and he's ready willing and able to give you his first hand impressions of an aircraft he is obviously has fallen in love with. General Stewart walks you through the Hustler's virtues and reviews the many records she claimed in a memorable discussion. --------------------------Manuals in printable Adobe Acrobat .pdf file format. * B-58 Hustler First Test Flight On Veterans Day, Nov 11th, 1956 Convair's revolutionary delta wing B-58 "Hustler" supersonic bomber took to the skies for the first time, piloted by B. A, Ericson, You'll see both the low and high speed taxi testing, including front wheel lift off, that proceeded the B-58's first flight, delivering excellent footage of the silvery prototype from a number of angles.The first flight takes the aircraft to Mach .7 at 20,000' and back down again without a hitch -- and you'll see it all in this memorable color film. * B-58 Hustler: Swift, Capable, Versatile, Operational! This film report from the US Air Force on the progress of the B-58 Program was produced by the Convair Division of General Dynamics in January 1961. Highlights include B-58 crews scrambling from their '58 Chevy to get their Hustler airborne; the 18th Sept, 1959 low level capability demonstration flight from Texas to California averaging over 600 kts at altitudes below 500', unique film of a B-58's automatic release of it's weapons pod at Mach 2, at over 50,000'; 43rd Bomb Wing B-58s win SAC's 1960 Combat Competition, defeating 24 other aircraft in both high & low level bombing classifications, and the amazing string of speed and altitude records set at Edwards AFB in January, 1961. * Airplane 11: The First B-58 Trainer The first trainer version of the Hustler, the TB-58, was delivered by General Dynamics to the US Air Force in August, 1960, the first of eight R&D aircraft (this was "aircraft 11" in the test series) converted for that purpose. The biggest change involved converting the Bomber/Navigator station (2nd seat aft) to a pilot/instructors compartment with instrumentation and controls.Highlights include great footage of the colorfully painted TB 58 training version in operation, a tour of the mock up of the converted crew section, and unique in flight footage shot from inside the aircraft. * Open Road III: B-58 MITO Tests During the depths of the Cold War, SAC bombers had only 15 to 20-minutes to get airborne between the launch of enemy missiles and their arrival at US targets. That meant that the ability get US air forces on their way quickly and efficiently was absolutely essential for survivability, striking power and deterrence. A critical element in this quick response was "MITO" - "Minimum Interval Take-Off." This involved determining the optimum interval between the launching aircraft to achieve the fastest possible deployment. There's some beautiful B-58 take-off footage here. * B-58 Ejection System Development The B-58 was the first aircraft capable of operating at sustained supersonic speeds at very high altitudes. That posed new problems for crew ejection and survivability. This film, produced by General Dynamics and the US Air Force, shows the unique challenges in ejecting from the B-56 and the solutions that were developed over time. * Escape and Survive Developed by B-58 capsule subcontractor and ejection seat pioneer Stanley Aviation, this film focuses on the design, manufacture and testing of the capsule itself.